Think you can mix it up on the ones and twos? Wanna show off your skillz? or just watch some peeps scratch something other than their nuttz... 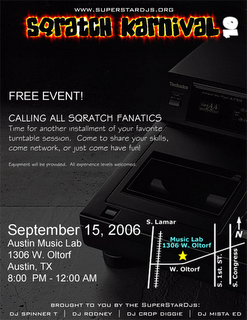 It's been awhile but... Sqratch Karnival X is coming Sept. 15th at the Austin Music Lab. A lot of competition that weekend with ACL Fest and all but definitely check it out if you can. Weeks been rough yo... lab issues like crazy... first our lab's power blows up... literally... no joke... and whatever happened killed our switches... network issues for like two days now... insane. Scratching is a DJ or turntablist technique originated by Grand Wizard Theodore, an early hip hop DJ from New York (AMG). Theodore developed scratching from DJ Grandmaster Flash, who describes scratching as, "nothing but the back-cueing that you hear in your ear before you push it [the recorded sound] out to the crowd." (Toop, 1991) Kool Herc was also an important early figure. The technique is designed to accentuate the work of the DJ by creating an assortment of sounds through the rhythmical manipulation of a vinyl record, and has spread from hip hop culture to a number of other musical forms. Within hip hop culture, scratching is still of great importance in determining the skill of a DJ, and a number of competitions are held across the globe in which DJs battle one another in displays of great virtuosity.